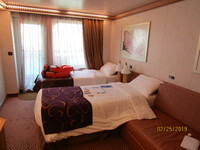 I chose this cruise because of the ports being visited and the low cost. The internet service was horrible, and when I complained and asked for a refund, I was told that it wouldn&apos;t be possible. They canceled two of our pre-booked shore excursions - one because it was on disembarkation day (hello - why was it even offered, and why did they let us book it? ), and the other because there were not enough English speaking passengers. The next day; however, we were on a shore excursion with 47 English speaking passengers and 4 German passengers, so we had to listen to the whole thing in both languages. Why couldn&apos;t they have done that for us on the previous day? The entire cruise catered to the Italians, and it was tiresome to have to hear everything in 6 languages, not to mention that it was clear that they were joking and laughing with the Italian passengers and not translating what was happening to everyone else. They were very chintzy when it came to game prizes (one prize for the whole team, and it was always a thin little tote bag), and the only activities were one or two video quizzes and dance lessons. Bingo was expensive, only played twice, and only one game each time. The food was awful - obviously frozen and thawed, not cooked fresh, and the same old items every day in the buffet, and only 3 choices in the dining room. Water, anywhere but the dining room or buffet, was not free, and in the dining room it was only free for the Americans. Staff was often rude for the most part and didn&apos;t offer any accommodation for any complaints or problems. Because every port was an embarkation/debarkation port, the elevators near our room were closed down all afternoon, and then we had to listen to the muster drill more than once. Your credit card is billed in daily increments that never match the daily charges, though the total did appear to be correct. The cabin was spacious, with a large vanity area and plenty of drawer/shelf storage. The closets were horrible - very small and only had 7 huge (fat) hangers with no room for more! Beds were comfortable; sofa bed seemed old and was coming apart. Took the hop-on, hop-off tour and it was great. Very nice tour, though more walking than I would have liked. Great guide, beautiful island, nice amount of free time. 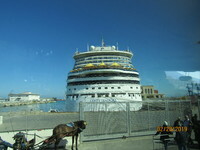 Our excursion was canceled by the cruise line, so we did it on our own.